Paul’s Boutique is renowned as that colourful brand that never fails to throw us a lively accessory collection or two that's bound to brighten up every bland wardrobe. The edgy bag designs started out on London’s famous Portobello Road Market, quickly grabbing the attention of celebs like Rita Ora and style icon Pippa Middleton. It soon became that globally recognized bag brand of choice - so if you’re fashion-forward or looking for a new take on that indispensable accessory - don’t wait to get acquainted with Paul’s Boutique. While we’re sure you’ll find your favourites in no time - whether that’s a cross body bag in electric blue or a backpack sporting a snakeskin or sleek textured finish - in the bestseller section, you will find those fancy numbers that are making their mark on fashionistas everywhere. Shop the LookBook for the latest seasonal collections and the toughest task you have at hand is deciding how many bags and purses you’re going to introduce to your wardrobe. How do I use my Pauls Boutique coupon code? Choose a voucher code to copy and shop the Paul’s Boutique catalogue online. Add your bags to your bag and click on the bag icon to check out. Enter your coupon code in the box provided and hit ‘go’. Checkout with your savings. Join the newsletter and Paul’s Boutique will give you money off your next order, what a treat. Does Paul's Boutique do student discount? Sign up with UNIDAYS and you’re in for 15% off your fancy new bag. Can I track my Paul's Boutique order? Orders usually take 1-4 days to despatch and deliver, track yours online. When is the Paul's Boutique sale? Each season, you are sure to find some sweet sales on at Paul’s Boutique, stay in touch with us and we’ll let you know all the details. Delivery is free over £50, £1.95 for orders under £20 and £4.95 for those between. Premium Delivery is available from £6.95. You can return items in their original condition for a full refund or exchange within 28-days of delivery. Items after 28-days and up to 6 months later will be considered if they are sent back unused and in their original packaging. Email Paul's Boutique: UKService@paulsboutique.com or use the contact form. Call Paul's Boutique: 020 8845 2293. Influential bag brand Paul’s Boutique has been mastering that essential accessory since the year 2000. 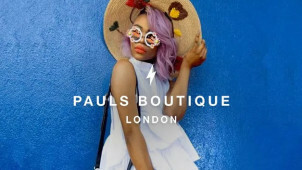 Making waves and now boasting a far-fetched catalogue, brimming with snazzy designs in bags, purses, mini bags and more, a Pauls Boutique voucher code is your golden ticket to heaven. With structured designs that play on the fiercest of colours and textures - it’s easy to spot a cool kid flaunting a little something from Paul’s Boutique. Every bag and purse from Paul’s Boutique is crafted to inspire your outfits and to perfect them too. Keeping you on trend each season, the blog is where you’ll find all the news on the latest collections, as well as where the holiday or even brunch hotspots are at. Your lifestyle edit starts here, from which bag to wear and where to wear it - Paul’s Boutique knows what’s best for you. You’ll be able to match every outfit for every occasion with a Paul’s Boutique handbag. Whether you need a shopper, tote or a clutch bag for the evening - keep a Pauls Boutique discount code close by to save on your loud and chic accessories. From day to night, from the office to the disco, a bag from Paul’s Boutique will make you stand out loud and proud.